LUBBOCK, TX (KCBD) -A nationwide helium shortage is deflating a local party business, along with the rising use of online retailers like Amazon. As a result, that decades old one-stop-shop for party supplies announced it is going out of business. 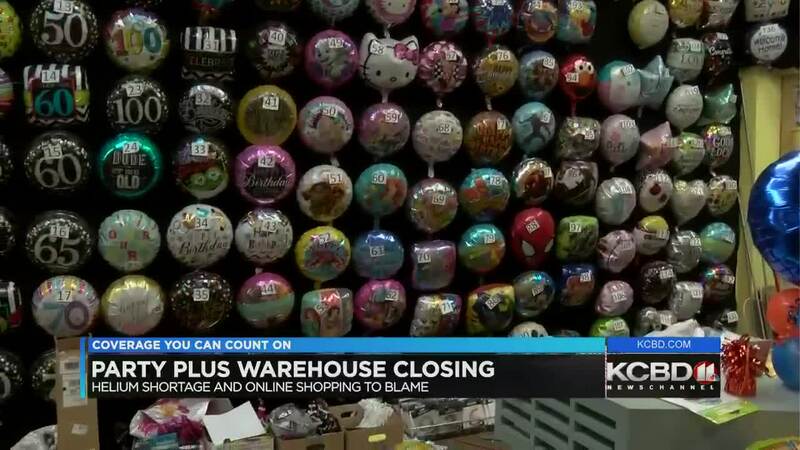 From balloons, to baby shower supplies, wedding cake toppers, and plates, if you want it for a party, the Party Warehouse probably has what you’re looking for. Their most popular item though has to be the balloons, but now that item that keep them afloat, may be grounded indefinitely. That shortage stemming from several factors, including sanctions on overseas supplies, and lower U.S. production, but balloons aren’t the only thing hurting business. Now they’re looking for someone else to takeover. “We don’t have a new buyer yet, we have about three people that are interested,” adds Hodges. While no buyers have made any offers at the Party Plus Warehouse, at Gales Wedding Rentals and First class Tuxedo, recent talks have made them optimistic for the future. For anyone that’s already rented for future occasions, the Hodges want customers to know that, “If you have any rentals coming up, whether it’s on the tuxedo or rental side, no worries, we will honor those. If it’s us or if it is a new owner, I do not want ya’ll to worry. They will be taken care of one way or another. Next article Can money buy happiness?